In the midst of putting the finishing touches on my course, Style Your Way Home, before it launches in just 2 days I was going back through my folder of over 2,000 emails that I’ve received in the last year that give me a glimpse into what your biggest frustrations are when it comes to decorating your home, and as I was reading something big hit me, that I have to share with you. In hopes that it might help you get unstuck and moving forward with your decorating and not make you feel like you’ve painted yourself into a corner. In hopes that this idea might free you up when it comes to how you think about your decor and give you the freedom to express yourself more freely. That’s right a home decor style IS NOT a theme. Themes are for birthday parties, nurseries, and kid’s rooms. Your home however should have a style that is unique to you. And that style should actually include a few different styles mixed together to get that unique to you (and your family) look. But you should never think of your decor in terms of a theme. Why you ask? Because themes are boring. They don’t leave any room for different parts of your personality to show through. They are way too narrow minded. Not to mention themed decor doesn’t leave any room for your style to evolve over time. You love the beach so you decorate your home with a coastal theme. I mean you really go to town. You’ve got seashells galore, rope accents, sailboats, fish, blue, green, tan, jars filled with sand. Heck, you even have some net accents thrown in there. Then one day you realize that the coastal decor aisle of HomeGoods actually has less coastal decor than your living room and it looks like you are hosting a luau party, not getting ready to watch the game with some friends on a Sunday afternoon. That and you are liking the gold trend, but fear that it won’t fit in with the shells and nets so nicely. Adding a gold accessory will stick out like a sore thumb so you are stuck. Adding in even one “off theme” accessory will throw the whole thing off balance and you’ve literally painted yourself into a decorating corner all because you thought of your home decor as a theme. Decor should never be thought of as a theme just like you wouldn’t think of an outfit like a costume. Not everything has to match, it just has to go. Your decor should have a main character, and supporting characters to play off of it. This allows you to showcase different parts of your personality as well as allow you to like different styles as long as they are put together in an intentional way. Even styles that seem completely opposite can actually compliment each other really well. Think modern-rustic, industrial-modern, or even country-chic. All opposites. All create really interesting spaces that tell more than one story about a single person. 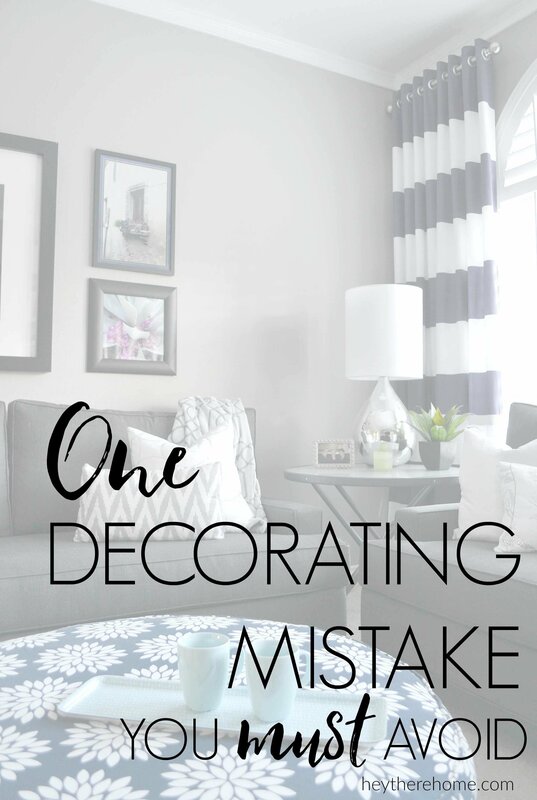 The key of course is to keep in mind the 80/20 rule, have each item have a buddy, and place the various styles, tones, and textures evenly throughout the space like we talked about in detail in this post: 4 Practical Tips For Mixing Decor Styles. I believe that home is the most important place on earth and it should feel great and grow with you. I love making our home our favorite place to be and I love teaching you how to do the same. So if you are ready to get your decor style right, ready do a deep dive into what that means for you and your home, and come out on the other end in less than 30 days with a plan of action that will get you decorating with confidence and on your way to creating a cohesive home you love, I hope you’ll join me on Thursday when enrollment for my course, Style Your Way Home, opens up! I’m so excited to meet my first group of students and can’t wait to guide them, cheer them on, and watch them gain some decorating confidence! I hope you are one of them! This is really smart and really spot on, Corey. Nicely done. I might know a certain sweet mother-in-law of mine who went all in with the “coastal theme” sea shells, nets and all. Great mistake tip… it gives you freedom to change over the years!